The Star Wars canon changed forever Saturday night with the latest episode of Star Wars Rebels, “Twin Suns.” It was a massive episode in terms of character, Star Wars history, and precedent. So we simply had to talk to Dave Filoni, the executive producer of Rebels, to get the scoop on the Obi-Wan Kenobi/Darth Maul rematch... and that very surprising cameo. There’s so much to discuss here, but let’s start with the biggest thing in terms of canon: Obi-Wan Kenobi kills Darth Maul. He’s dead. Gone. For good this time. Since Filoni had decided to bring Darth Maul back in The Clone Wars originally, he felt a responsibility to end the former Sith apprentice’s story. So he and the Rebels production team checked with several members of the Lucasfilm Story Group to make sure there weren’t any future plans for the character in other Star Wars media. But for Maul, there really couldn’t be. Maul’s death comes very quickly and very decisively. Kenobi kills him with only a few short moves and Filoni knows that may be a controversial decision, but one he didn’t make lightly. Filoni said the inspiration for the fight was Kyuzo, the master swordsman in Akira Kurosawa’s Seven Samurai, and his duel which he doesn’t want to fight because he knows it will be over quickly. Plus, Filoni saw an opportunity to really highlight their characters with a quick, decisive battle. Filoni hopes the duel, and the moments after, are the perfect representation of one of the most important conflicts in all of Star Wars. “It really is to express the difference between the Jedi and the Sith. Which is the Jedi become selfless and the Sith remain selfish. When pressed, because Obi-Wan is protecting someone else in the end, he does fight. But because he is so true and knows who he is in that moment, you can’t defeat that. So Obi-Wan is going to strike down Maul because Maul is such a broken and lost person, which I think is why in the end you see Maul being cradled by Obi-Wan. Maul tries to get Obi-Wan with a very similar move as he gets Qui-Gon. Which is he blocks and uses the blunt of his hilt to smack Qui-Gon in the face. So I had Maul try to do the same thing to Obi-Wan but again, to show growth, Obi-Wan is ready for that and slices it right in half. That slicing of the lightsaber hilt is to represent Maul being sliced. But we all joked that maybe Obi-Wan should dice him up and bring him to other parts of the planet because he tends to come back, that crafty Maul. But not this time. All throughout the episode, it’s mentioned that Obi-Wan is watching over someone, “the chosen one.” “He’ll avenge us all,” Maul says. Obviously, there’s no question who they could be referring to. And at the end of the episode, we see Luke Skywalker running around as a little boy at the Lars homestead, with the binary sunset, and hear Aunt Beru calling him, along with iconic John Williams’ iconic score. “We have to look at every episode of Rebels as if you’ve never seen Star Wars before. So if you think of it that way whenever Maul and Obi-Wan are talking about ‘The Chosen One’ or ‘Who are you protecting?’ if you never see or we don’t give the context of that, there are a lot of people who won’t know whats going on there. The Star Wars fan will but the average person will not. So at the very least the scene establishes, in its simplest form, there’s Obi-Wan, he was protecting someone, and there’s a woman yelling ‘Luke,’ and we see what we think of as a young boy running. ‘Oh, so Obi-Wan is protecting a boy named Luke.’ It’s designed to give you that specific bit of information that you need in the story. As fun as it is to talk about legacy characters like Luke Skywalker, Obi-Wan Kenobi, and Darth Maul, this is Star Wars Rebels after all. It’s not the story of those characters, it’s the story of young Jedi-in-training Ezra Bridger. Bridger is a key component in the episode, but how these events will change him remains to be seen. Bridger’s involvement was so important to the director/writer/producer that he personally storyboarded the entire episode where Ezra walks out from the archway (above), all the way through the end credits. I really wanted to get into the psychology of this moment and what it’s like for Ezra to commit to going out into this nothingness to find this man. And it’s a very searching moment. Mythically. Going out into the desert is almost like a purification thing. 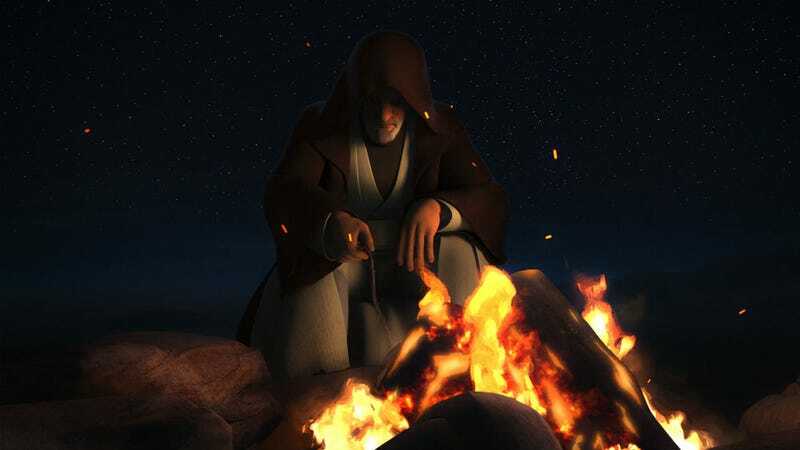 Traveling through fire, traveling through cold, coming out on the other side….It’s Obi-Wan. When it’s all on the line like that I have to be right there. Star Wars Rebels wraps up next week with a two-part finale and then will be back later this year for its fourth season, already in production.